With the Tour de Yorkshire pedalling its way through the region once again this month, we’re celebrating the wealth of food and drink on offer in the region. West Yorkshire alone plays host to more breweries than the capital, so as cyclists make their way through the region we are encouraging them to enjoy a beer as their perfect post-ride beverage. While it may seem mad to suggest drinking a beer rather than water after a long cycle, research shows that a couple of bottles of beer can be just as hydrating as water…and it tastes better. As the pros will know, groups of cyclists will often meet at a pub before and after the ride. Really, it would be rude not to call into said pub for a pint or two to catch up with everyone. As keen cyclists ourselves, we’re incredibly proud of the legacy that Le Tour has left in our region. Having launched our Stage Winner in 2014 dedicated to Brian Robinson, the first Briton to win a stage of Le Tour de France, we want to continue encouraging cyclists of Yorkshire to consider beer as their go to post-cycle drink. Our brewery sits just off the longest continuous gradient in the country, so if anyone needs to stop for a refreshment along the way, we always welcome them into the brewery shop to buy a bottle or two to enjoy at the end of their ride – or during! 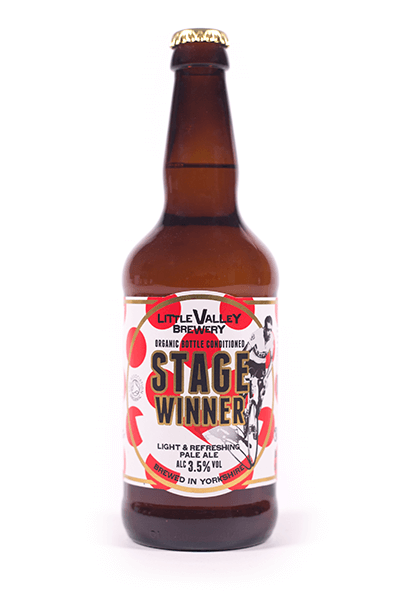 Find out more about Little Valley by following us on Twitter here: twitter.com/LittleValleyAle.